I tested this with an ATTiny44A-PU and got an LED to blink, so I think this is good. 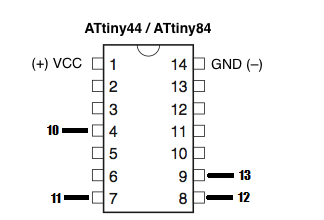 I haven’t tested an ATTiny84, but assume it’s the same thing. Let me know if there are problems. This entry was posted in Uncategorized and tagged arduino, attiny44. Bookmark the permalink.